We purchased this beautiful Frigidaire side by side refrigerator back in Dec. 2010. It worked great for 11 months -- let that hit you, 11 months. Doesn't that seem a bit short for a refrigerator to work great for? We woke up one morning to find water leaking out of back panel. After looking at it fully we found there is a hole from the inside to out due to the fact that it is rusting!! How could it be rusting? Shouldn't a refrigerator company expect the metal to have condensation and water on it and in turn protect it from touch so as to prevent it from rusting? We had a repair company come out (recommended by Frigidaire). 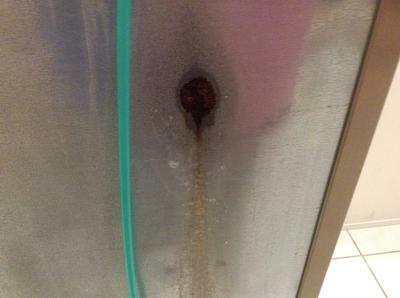 After examining it they wrote that it has breach in the insulation which is causing the back panel to rust. They told us that it is non-repairable. We called Frigidaire and they told us that they won't do anything. So $2200 down the drain. All we can say is whatever you do, don't buy a Frigidaire refrigerator or any other Frigidaire appliance. They aren't well made and the company doesn't stand by it's warranty. FPHC2399KF2, counter depth, french doors "Professional" series Frigidaire. It will not hold inside temperature when outside temperature changes. For example: If outside temp is 72 degrees, inside temperature is correct; In summer when outside temperature is higher, I must turn fridge temperature setting down in order to keep food fresh; If outside temperature is lower I must turn the refrigerators temp up to keep food from freezing.